Last Summer I backed a Kickstarter fan project that collected a series of comics and cartoons depicting the everyday life of my favorite space bounty hunter, Samus Aran (of the Metroid series of videogames), into a hardcover book. 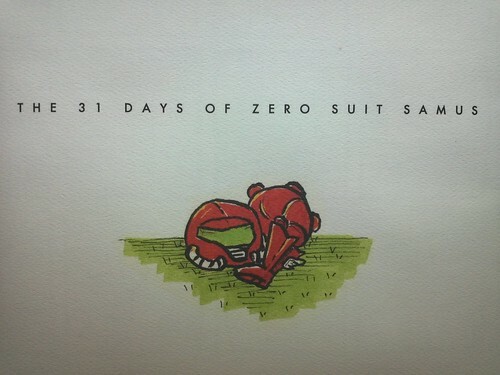 This cute series of comics, The 31 Days of Zero Suit Samus was brought to life and posted on the web by artist Chris Furniss and writer Ross Rosenberg in the Summer of 2011. Rosenberg supplied the topic for each day and Furniss drew it. 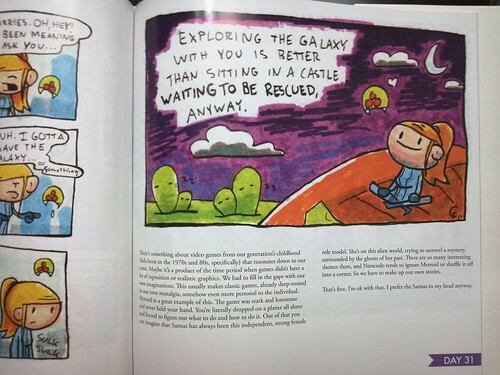 At the end of the month, they had a whimsical collection of mini stories of the life of Samus Aran beyond her day job. The Kickstarter was launched in May 2012 and it was very successful, so the project to create a print edition moved forward. I debated between backing at the Gravity Suit Level or the Phazon Suit Level, the latter of which netted everything at the Gravity Suit Level plus a custom, hand-painted Metroid NES cartridge and your very own custom illustration of a Zero Suit Samus day that you come up with. That custom illustration was the main attraction for me. Unfortunately, I could not justify the expense, so I went with the Gravity Suit Level. For what it’s worth, my Zero Suit Samus day idea was “Zero Suit Samus Has a Tea Party.” In that cartoon, Samus Aran would be having a tea party with some of my favorite videogame heroines, like Faith Conners from Mirror’s Edge, Chloe Frazer from the UNCHARTED series, and a couple more obscure characters. It would have been cool. PDF download of the book and a PDF download of the sketchbook used while working on the series. 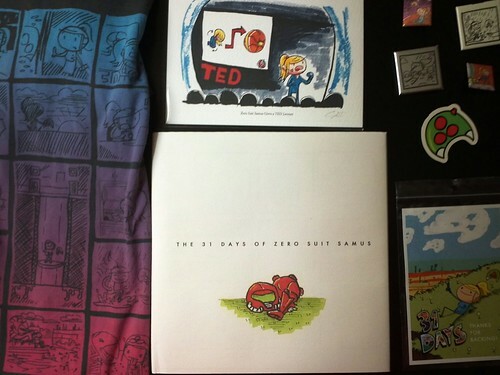 A hand-signed hardcover copy of the book, exclusive to this Kickstarter campaign. A hand-signed 8×16 print and my name in the “Special Thanks” section at the back of the book. The backer rewards all turned out very well. It’s an amazing fan tribute to Samus Aran and the Metroid series. As a long-time Metroid fan, I approve. When I discovered the project on Kickstarter, I had misgivings about it. I dislike the Zero Suit’s role in encouraging the misogynistic elements of Metroid fandom to portray Samus Aran as a sexual object, and I was concerned that this project would help promote that. I didn’t know the background of the comics, nor did I see the comics as they were being posted online in 2011. However, after taking a look at the comics via the Kickstarter project page, I was satisfied enough that this book of cartoons didn’t encourage that sexist aspect of fan appreciation. I still had mixed feelings, but decided to back it anyway. After all, there was a comic in this series in which Samus Aran was giving a TED Talk and the art style is super cute. The introduction to the book obliterated any remaining mixed feelings I might have had about the concept. It also made me feel encouraged that men are thinking critically about the sexual objectification of female characters in games. One of the reasons that Furniss and Rosenberg created these comics was out of frustration regarding the portrayal of Samus Aran in fan culture. Samus Aran as a character has always been treated with an element of objectification since the original Metroid game in 1986, where if you got the “best” ending, Samus would be presented wearing a bikini. Since the release of Metroid: Zero Mission and the introduction of the Zero Suit (a skin-tight body suit worn underneath her space armor), this misogynistic factor has increased not only in the first party art produced depicting Samus Aran, but also in the creation of fan art, where Samus is often portrayed in degrading and pornographic scenarios. The 31 Days of Zero Suit Samus imagines a Samus Aran not as a sexual object, but as a woman with life outside roaming the galaxy hunting pirates for bounties. It’s encouraging that Furniss and Rosenberg felt strongly enough about this particular trend with Samus Aran to react to it by creating something good and by going against how Metroid fandom has often portrayed her. The book itself is of high quality. I like the simple dust jacket, which is exclusive to the Kickstarter. 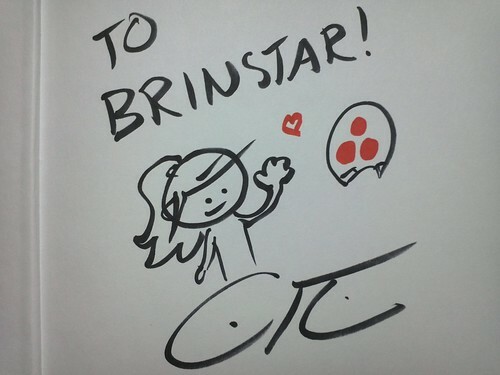 I was especially happy to see that the personalization message in the front of the book used my internet handle, ‘Brinstar,’ which most old school Metroid fans will know is the name of a location on one of the planets that Samus Aran visits in Metroid and Super Metroid. Each of the cartoons includes commentary about the creative process from Furniss and Rosenberg. At the end of the book is a collection of Zero Suit Samus tributes from other fan artists. And finally at the end is the “Special Thanks” section, where you’d spot my name if you had a copy. As part of the Gravity Suit Level, backers received a 31 Days of Zero Suit Samus t-shirt with a choice of four different colors. This shirt was exclusive to the Kickstarter. They collaborated with Fangamer to create this shirt. Fangamer is known for high-quality shirts that celebrate games. Their designs are often subtle and are great tributes to various different videogame series. I own quite a few Fangamer shirts, and almost all of their Metroid-related shirts, so I was pleased that the 31 Days team partnered with Fangamer to create this shirt. I was concerned about the sizing, due to the fact that they did not offer any size options for women. I was worried that the men’s small shirt would be too large and that the shirt would be relegated to sleepwear. However, I was pleasantly surprised to see that the shirt was small enough for me to wear in public, though it is ever so slightly too big. There were definitely not enough size options, so unfortunately I think a lot of people might not have been able to get the size they really wanted. The 6-inch by 18-inch giclée print depicts Zero Suit Samus at a party attended by a bunch of Nintendo (and one Sega) characters. The paper is very thick and of high quality. I got it custom-framed. 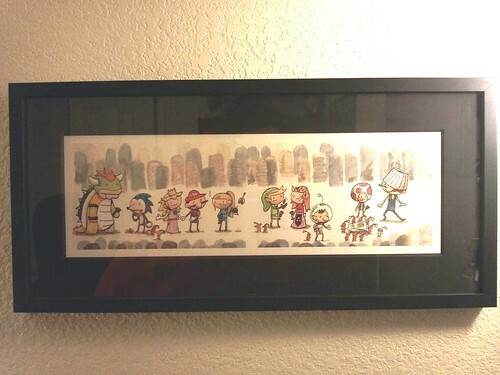 The folks at the framing store appreciated the little scene of videogame characters and thought the print was really cool. The framed print looks amazing in my computer room. I’ve hung it right below another Kickstarter reward, my also-amazing Samus Aran giclée print from the Ukiyo-e Heroes project (not pictured).